HOMELESS PHOTO ESSAY AT NPR.ORG. This is Paul, a homeless neighbor living in Wilkes-Barre, Pennsylvania. He's one of several folks who let photo journalist Gary Clark into their world. 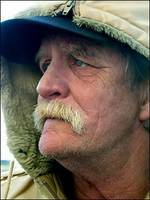 An excellent story, "Picturing the Homeless, on Their Terms" is at www.npr.org.